To Give A Smile was founded to bring hope and care to children facing illnesses. The organization works directly with hospitals and organizations to provide uplifting and encouraging outreaches designed to bring a smile to the life of a child. Activity Outreaches are a fun way for our volunteers to interact directly with children and their families. We currently work with hospitals and organizations in Texas and Ohio where we provide a craft, show a movie or just spend time with the children playing games and getting to know them. We also work with organizations like Ronald McDonald House where we provide meals for families that are struggling with a child’s illness. 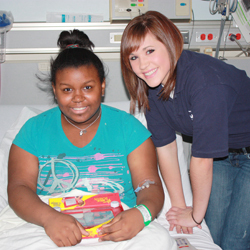 Each year we partner with local businesses and churches to collect toy donations for children in area hospitals. In most cases our volunteers are able to deliver the toys we collect directly to the children receiving them. Our care package outreach is our latest way to show children that we care about them. Our care packages are reusable bags that typically include things like water bottles, activity books, toys and personal hygiene products. Each care package is customized for the location it will be delivered to. 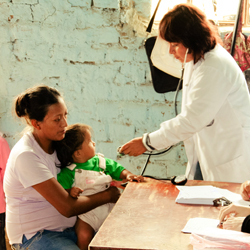 Each year the To Give A Smile mission trip teams are on the ground helping to facilitate medical clinics in locations where there is little to no access to medical care. As each individual receives treatment, area church members and volunteer team members are there to evangelize and share the good news that God loves and cares for them. We also provide activities, play games and deliver toys and care packages to the children we meet.